(Reuters) - California Governor Jerry Brown on Friday pledged to launch a satellite that will track and detect the sources of climate pollutants, his state's latest effort to challenge the Trump administration's skepticism about the science of climate change. 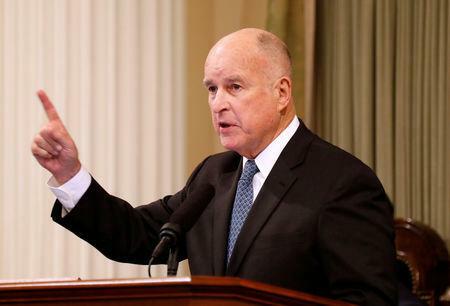 Brown, who was nicknamed "Governor Moonbeam" during his first stint as governor in the 1970s in part because of a proposal he made at the time to launch an emergency communications satellite for the state, said California was teaming up with earth imaging company Planet Labs to develop the technology. "We're going to launch our own satellite. Our own damn satellite to figure out where the pollution is and how we're going to end it," Brown told a gathering of political, environmental and business leaders. He did not give a timeline or cost for the project. The remarks echoed a pledge the Governor made nearly two years ago at a scientific gathering in the face of potential cuts to federal satellite and climate monitoring programs under President Donald Trump, who is skeptical of climate science. Data from the satellite would be shared with governments and others, Brown's office said in a statement, under a new initiative called the Climate Data Partnership with Environmental Defense Fund and others. The partnership has the potential to reduce emissions by 1,000 million metric tons a year, equivalent to taking 200 million cars off the road every year, the statement said. Initial funding for the project has been provided by philanthropists Dee and Richard Lawrence and their Overlook International Foundation as well as The Jeremy and Hannelore Grantham Environmental Trust, it said. Additional business and philanthropic partners are expected to join the initiative, according to the release.